When House lawmakers passed a bill to reduce the Court of Appeals from 15 judges to 12, Rep. Joe John was crushed. The Wake County Democrat spent a quarter of a century in the courts; he’s worked as a legal-aid attorney, a prosecutor and has served on the bench as a District Court judge, Superior Court judge and Court of Appeals judge. He spoke out on the House floor before a vote was taken along party lines. He pointed out that the appellate court’s workload didn’t justify the reduction of judges. He used his experience to try to give insight to legislators who might not understand the weight of their decisions. “It is possible that folks who had never been judges — and I am the only former judge in the House of Representatives and the Senate, as far as I gather — it’s possible they don’t appreciate and understand the judicial branch is not and has never intended to be a political branch of government,” John said. The General Assembly has been taking aim at the judiciary since former Republican Gov. Pat McCrory conceded the election in December. There have been a number of bills passed that change the structure of the courts. The bills, altogether, deal a blow to Democratic Gov. Roy Cooper — lawmakers appear to want to strip him of appointment power, and subsequently keep the opposition from becoming the majority. Cooper has said politics have no place in the courts and John agrees. The first-term lawmaker won’t go as far as saying he’s gotten used to his peers voting for judiciary bills, but by the time they took a vote last week to override Cooper’s veto of a bill that makes judicial elections partisan again, he wasn’t surprised. Still, John spoke up before the vote. “I say to you it is no exaggeration to characterize this issue as not just a vote, but a vote upon which the future of an independent judiciary in North Carolina depends,” he said. “We pretty much knew that was coming and I felt like I still had to make the points and make clear what, in my opinion, is going to be a very devastating result to judicial independence,” John said. John is very fond of his time on the bench and he’s surrounded by reminders in his office. He pointed to two framed posters that hang on the wall to his left. They show courthouses across North Carolina and John said he’d presided in at least 70 of them. 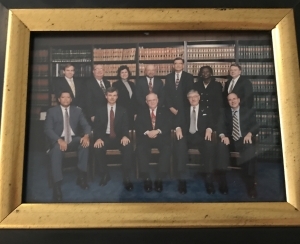 On his right hangs an artistic poster of the U.S. Supreme Court, a drawing someone did of the first courtroom he was assigned to as a judge and a framed picture of the band Alabama with a court schedule from litigation they were involved in. 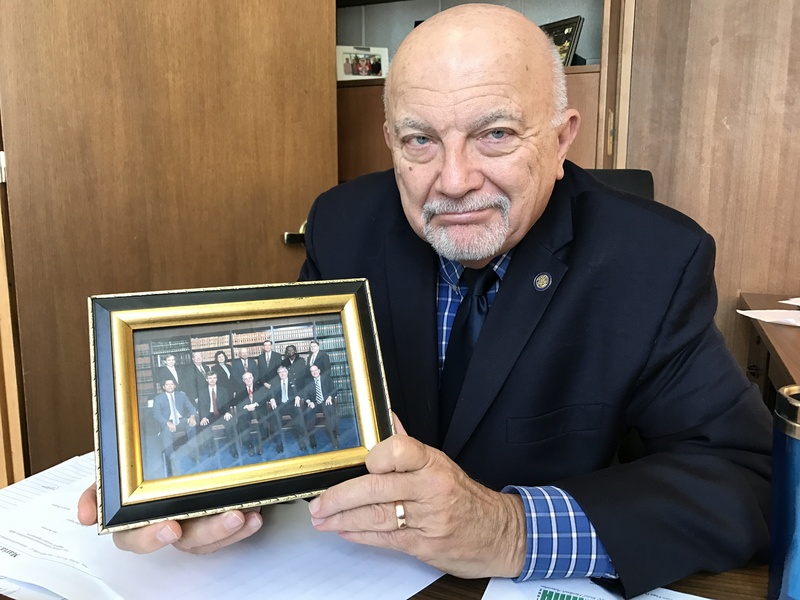 Rep. Joe John (D-Wake) keeps a photo in his office of himself and other judges, affiliated with both the Republican and Democratic parties, that he’s served alongside. Over the years, John has served with judges that belong to both political parties and he’s participated in partisan judicial elections. His knowledge is vast. He quoted Judge Neil Gorsuch, President Donald Trump’s conservative pick to fill a U.S. Supreme Court vacancy, to the House in explaining why there shouldn’t be partisan judicial elections. “He said it as well as it can be said; in our country, there are no Democratic judges and Republican judges, just judges,” John said. He believes that in light of all that’s been going on this year and in recent years that judges shouldn’t be elected at all and instead be selected through a merit-based process. “The partisan intensity is so much greater now than back then,” he said. John wouldn’t speculate about whether he thought more judiciary bills were coming down the pike. “Truthfully, I don’t want to imagine what else might follow but I guess we’ll see as time unfolds,” he said. The next “battlefront, if you will” is to try to convince the Senate not to pass HB239 reducing the Court of Appeals, he added. Don’t try to insult people’s intelligence by saying that it’s not politically motivated…. And whether it makes a difference or not, John said he plans to continue speaking on the House floor if he feels like his experience in the courts can shed some light on what bills are going through the General Assembly. After the last time he took a stance on the floor, he said judges reached out to him via social media and other means to thank him for fighting for them. “I’ve appreciated that and thought maybe that makes it worth it,” he said. Constituents have also sent emails in support of Cooper’s veto, which also pleases John. “It’s almost common sense, and I appreciate people being able to perceive that we need an independent judiciary, not one that’s controlled by partisan motivations one way or the other,” he said.